Comcast outbid 21st Century Fox and its powerful backer, Disney, on Saturday in an auction for control of European broadcaster Sky. 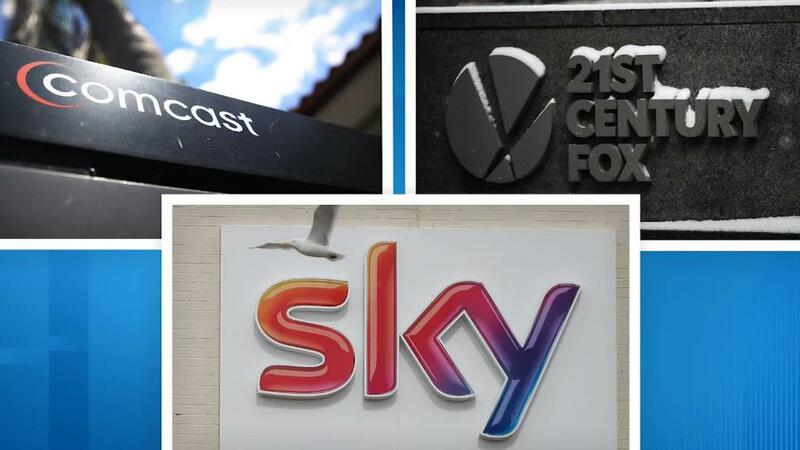 American cable giant Comcast lodged a winning bid of about $40 billion (£30.6 billion) for Sky following a rare, three round auction managed by UK's Takeover Panel. In the auction's final round, each company submitted a "sealed" bid, which was made public Saturday evening by the Takeover Panel. Both companies were vying for 61% control of Sky. 21st Century Fox already owns 39% of the company. Both companies must now make their offers official. On Saturday, Sky's Independent Committee unanimously recommended Comcast's offer. Sky shareholders have until October 11 to accept the offer. Sky and its 23 million subscribers are attractive assets to US media companies that want to expand their operations to Europe and bolster their defenses against an onslaught from Netflix and Amazon. Sky, which also sells broadband and mobile phone services, also carries top original shows and valuable premium sports content. The auction could spell the dramatic end to Fox chief Rupert Murdoch's long-running quest to buy out the rest of Sky -- Fox has been trying to take over the 61% of Sky it does not already own for years. In 2011, Fox abandoned an effort to take over the full company following a phone hacking scandal at News of the World, the defunct tabloid also owned by Murdoch. In December 2016, Murdoch tried again, offering £10.75 ($14.05) per share. UK media regulators put the bid through the ringer and Fox faced questions over whether it was a "fit and proper" owner, and whether the deal would give Murdoch too much power over UK media. Regulators eventually agreed that the sale could go through as long as Sky News was spun off in an effort to protect its editorial integrity. In February 2018, Comcast floated that it was preparing a bid at £12.50 ($16.35) per share, making the bid formal in April. Fox topped that with a £14.00 (18.30) per share offer in July, and Comcast responded the same day with its £14.75 ($19.00) offer. Around the same time, Disney and Comcast were battling to buy most of 21st Century Fox's entertainment assets, including its 39% stake in Sky. But Disney won out in the end with a $71.3 billion offer. Disney CEO Bob Iger had described Sky as a "real crown jewel." Comcast CEO Brian Roberts has also called Sky a "jewel" and told reporters in February he decided to go for Sky partly because of an experience with a London taxi driver who took him to a Sky store. In a statement on Saturday, Roberts called the auction results "a great day for Comcast." "Sky is a wonderful company with a great platform, tremendous brand, and accomplished management team. This acquisition will allow us to quickly, efficiently and meaningfully increase our customer base and expand internationally," he said. "We couldn't be more excited by the opportunities in front of us. We now encourage Sky shareholders to accept our offer, which we look forward to completing before the end of October 2018." Sky CEO Jeremy Darroch said it was "the beginning of the next exciting chapter for Sky. "As part of a broader Comcast we believe we will be able to continue to grow and strengthen our position as Europe's leading direct to consumer media company. Murdoch and his sons Lachlan and James, said that they are considering their next steps with regards to the 39% of Sky they still own and "will make a further announcement in due course," according to a memo to staff obtained by CNN. "Sky is a remarkable story and we are proud to have played such a significant role in building the incredible value reflected today in Comcast's offer," they wrote. Roberts and Iger have long battled and are said to be 'enemies,' dating back more than a decade when Comcast attempted a hostile takeover of Disney. Assuming Sky shareholders vote for Comcast's offer, Disney could potentially sell the remaining 39% stake in Sky to Comcast, giving the company full control. -- CNN's Oliver Darcy contributed to this report.